The automatic of Scriptcase already comes with the PostgreSQL enabled. To do the connection with PostgreSQL, please follow the steps below. Currently Scriptcase offers four drivers to connect with the PostgreSQL databases: PostgreSQL PDO, PostgreSQL 7 or Higher, PostgreSQL 6.4 or Higher e PostgreSQL 6.3 or Lower. PostgreSQL PDO ( Recommended ) : Allows the connection to be made with the PostgreSQL using the native PHP driver, which is superior in processing speed and constantly updated. PostgreSQL 7 or Higher : Allows the connection to be made and use the new functionalities of the PostgreSQL 7 or Higher databases. PostgreSQL 6.4 or Higher : Allows the connection to be made and use the new functionalities of the PostgreSQL 6.4 or Higher databases. PostgreSQL 6.3 or Lower : Allows the connection to be made and use the functionalities of the PostgreSQL 6.3 or Lower databases. Now we’ll access Scriptcase from Scriptcase from the browser and create a connection with the PostgreSQL database. 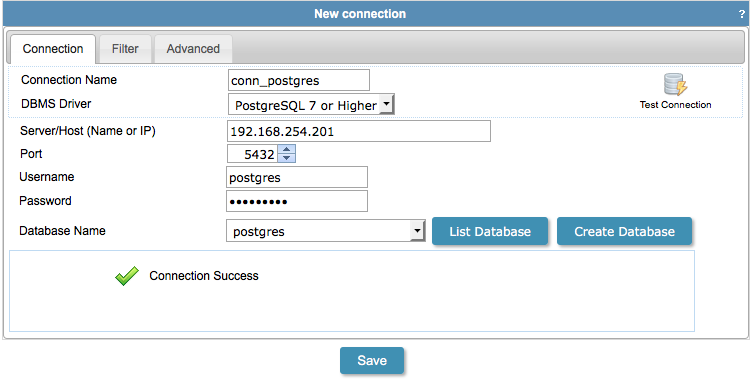 Step 2: After clicking “New Connection”, the page for creating connections will appear, click on the PostgreSQL database image. DBMS Driver - Allows you to define the driver that’ll be used, by default it’s PostgresSQL 7 or Higher. Server/Host (Name or IP) - Inform the location of the PostgreSQL database. Port - Inform the port to be used for your connection. By Default port is 5432. Database Name - Select the name of your database. User - Inform the user of your PostgreSQL database. Password - Inform the password of your PostgreSQL database.